The Fuji FinePix S1 is an amazingly versatile camera sporting a 50x optical zoom lens, WiFi, awesome O.I.S. and a weather-sealed body. It is a great travel companion that is ready for any situation. Its only downfall is high noise level at all ISO settings. Read more in our Full Conclusion. In early 2014, Fujifilm announced the FinePix S1. As the world's first "weather resistant" super zoom bridge camera, the S1 is designed to survive rain and dust. It features a 16-megapixel CMOS image senor, a 50x optical zoom (24-1200mm in 35mm terms, with an F/2.8-5.6 minimum aperture), 2x Intelligent Digital Zoom, a 3-inch Vari-Angle LCD Display, as well as a 0.2-inch Electronic View Finder (also 920K dots). The S1 also includes one-touch Wi-Fi capabilities to connect itself to a compatible smartphone or tablet using Fuji's Camera Remote app. Available for iOS and Android devices, Camera Remote allows users to make phones and tables into external displays and/or remote controllers for the S1. After images and HD videos are capture, it's then pretty easy to transfer the files to your phone, and share via your favorite social networking sites. 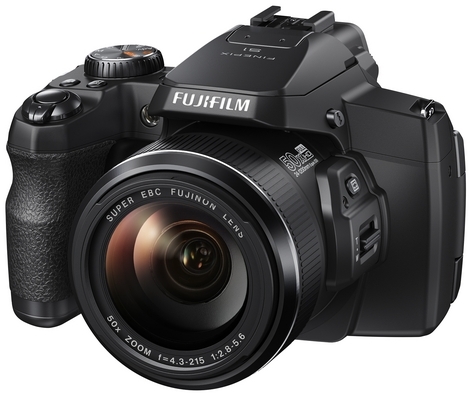 The Fujifilm FinePix S1 is available for an estimated MSRP of $499.95. See our lowest price box at the top right of this page to see the most current online pricing.